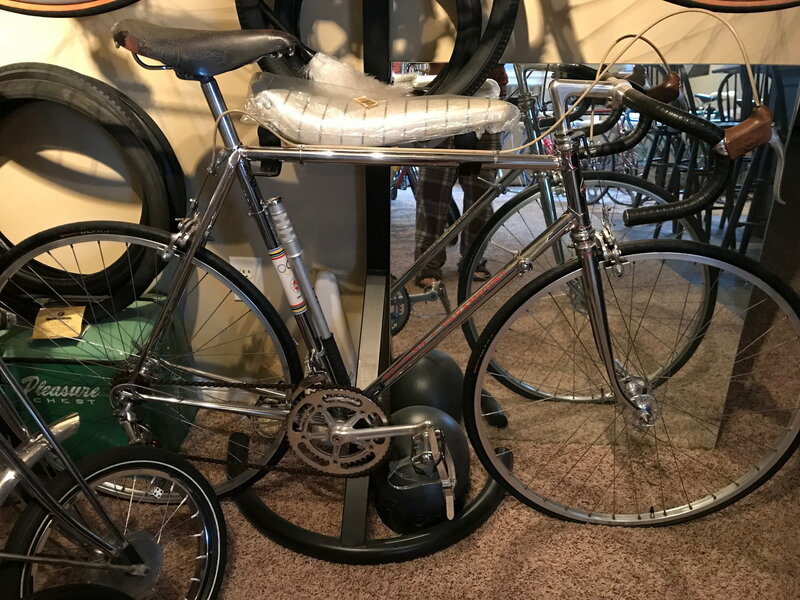 1973 Schwinn P15-9 Touring Paramount - Cinelli Bottom Bracket? Looking for the wisdom of the group. I just picked up a '73 (July '73 date code on the left rear drop out) Paramount P-15 touring. It's been repainted Silver and has most of the correct/original components on it. When I flipped it over I was quite surprised to see the bottom bracket stamped Cinelli - can you guys comment on this? 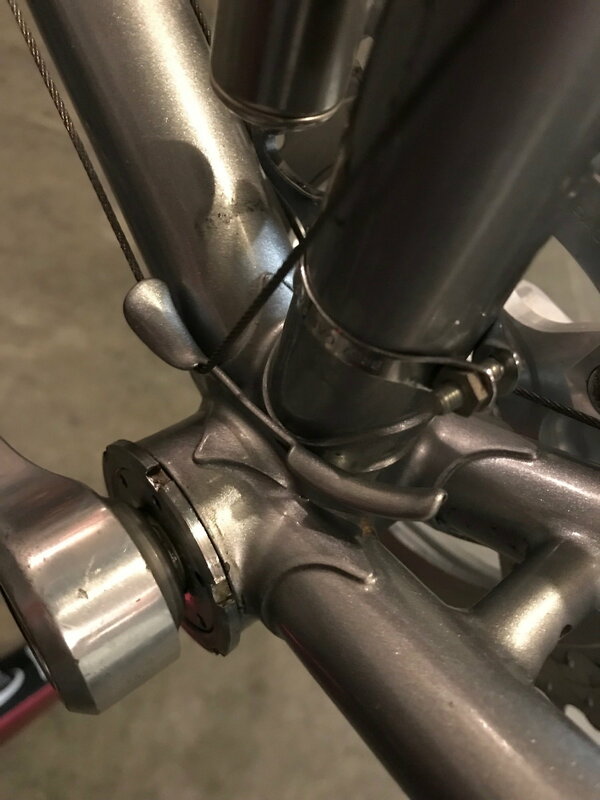 I've attached a few pics of the BB and note the front derailleur cable guide is not a chrome clamp on, but brazed on to the BB as well. Both of these findings strike me as unusual. 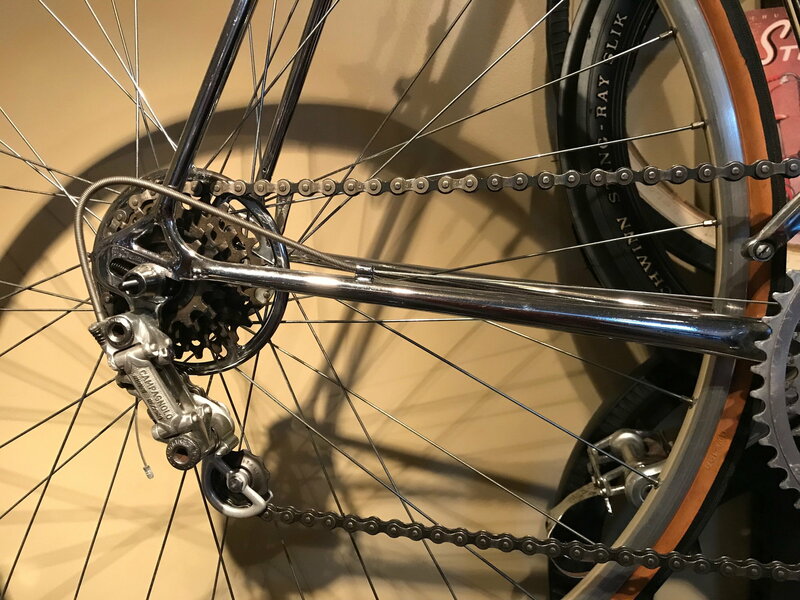 The lugs, head badge, chrome stays, etc, all look correct and the bike has the correct Campy parts including a '73 date coded triple crankset. Please let me know what you think! I'm going to locate the couple of incorrect parts (front derailleur, Cinelli bars/stem) and apply the Paramount decals. This bike was supposedly repainted by Waterford, so I'll contact them to see if they can verify. Thanks in advance for any info you can share on this one! Could be a bb replacement was the reason for the repaint. Very good point, maybe threads stripped, etc, and a new BB needed. Anyone else seen one with a Cinelli BB? Thanks! Repair, seems likely with repaint. What they had on hand or were able to get at the time. Silver was a stock color on these, this one will look great with the decals in place. Here's one of mine with original paint. Ahh yes, the color is great and the decals are a must! Yours is nice and shiny so it pops. We can't really pick what color comes along and I won't be changing it anytime soon. Beautiful bikes in this thread. 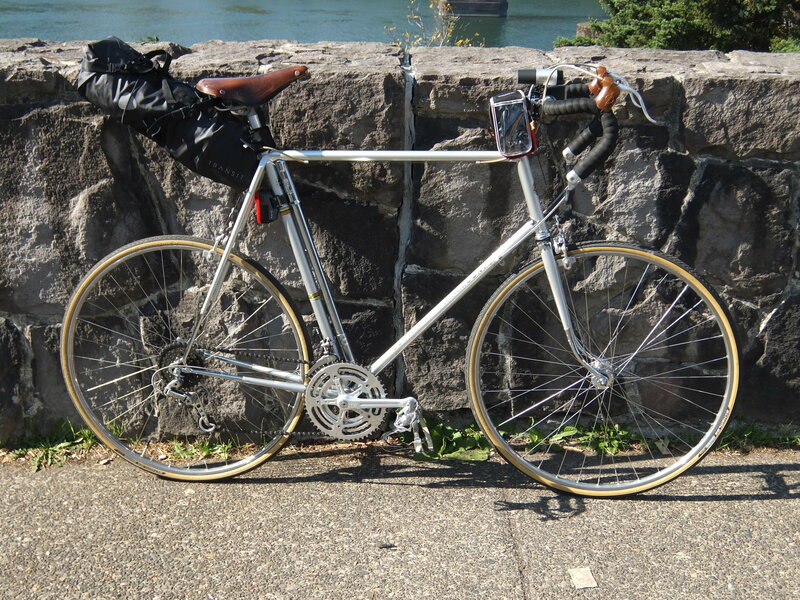 I thought it wasn't uncommon to find Cinelli BBs on higher-end American bikes? 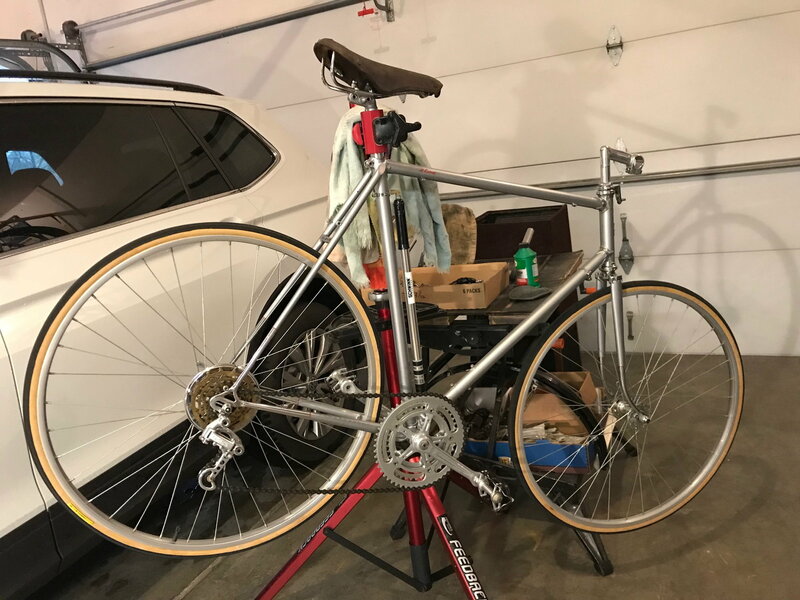 I know my 1983 Trek 760 had a Cinelli BB. Then again, I'm not really that knowledgeable on the Paramounts. You will probably get there, but the FD cable needs to get routed under the back part of the guide. Paramounts would usually be the exception to this, I have never seen one before. None of my 4 have one. 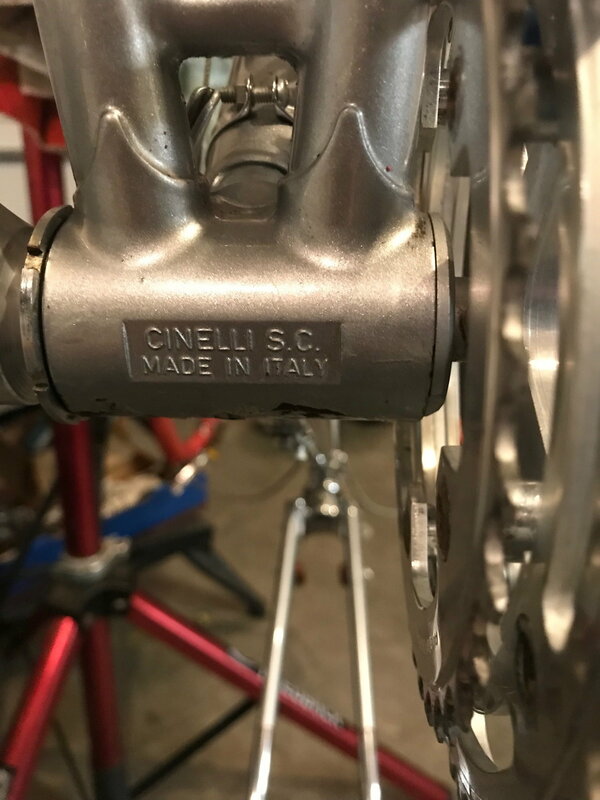 FWIW, I don't remember Cinelli BB shells with a big stamp saying Cinelli Made in Italy showing up until the 80s sometime. Likely 10 years plus too new. 70s stuff wasn't so heavily branded. Therefore, that looks to be a repair and repaint, presumably by Waterford. I'm not absolutely certain though. Perhaps there are records or someone has an old Cinelli parts catalog. Thanks, yes, these photos are "as found," and note the missing rear center pull cable yolk as well. I'll remove most everything down to the frame, clean, polish it, apply decals, and build it back up with fresh cables and housings. 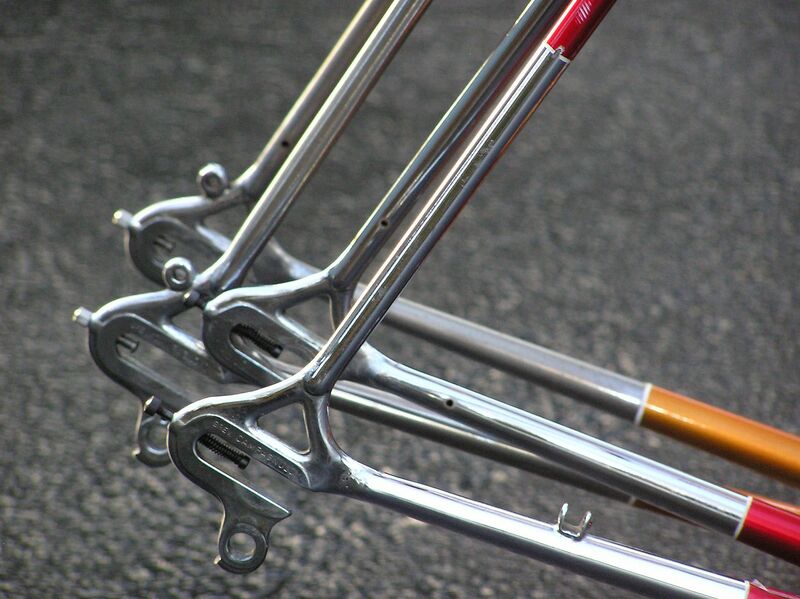 I'll keep the original metal housings for the RD and the bar end shifters though. Thanks guys - thinking this Cinelli BB shell is later than my bike and this was in fact a repair and repaint. Whatever it is, it's a total quality job that looks 100% factory. The paint is great looking and I've not even polished it yet. I'll need to call Waterford and see what they have in records available with my serial number. I know they do a provenance report for $50, but I don't know what they do for something that wasn't originally their build? We shall see....thanks again all for weighing in, I think we've solved the mystery, but if anyone has more Cinelli info to share, please let me know! An easy fifty bucks gets you a provenance report from Waterford. Sounds good, mine was in pretty good shape when it got to me. 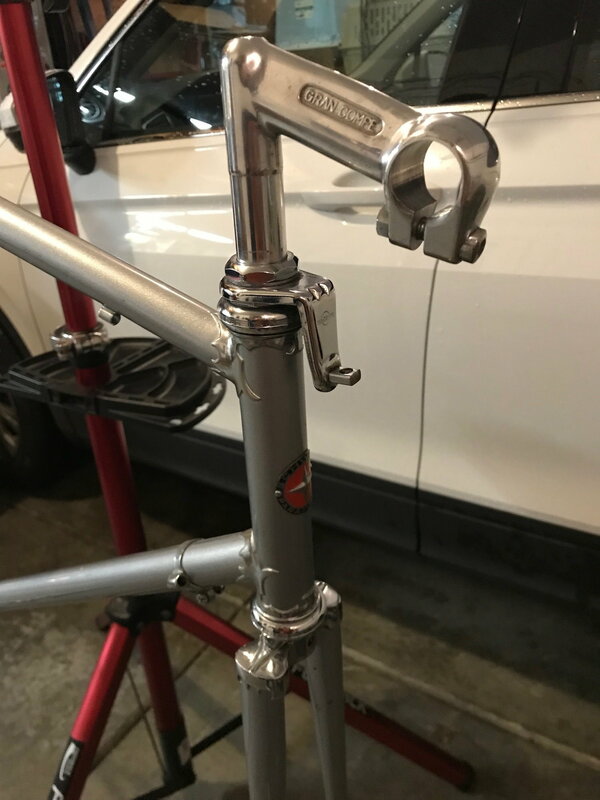 With Phil hubs and BB in good shape, the only things I did was install Schwinn Approved bar ends and grease the seatpost as I don't do DT shifters. It will get a HS overhaul soon and the decal is missing on the NDS so will get that too. Already looking better. Little polish applied and soon, decals, then rest of the components when I get back from vacation. 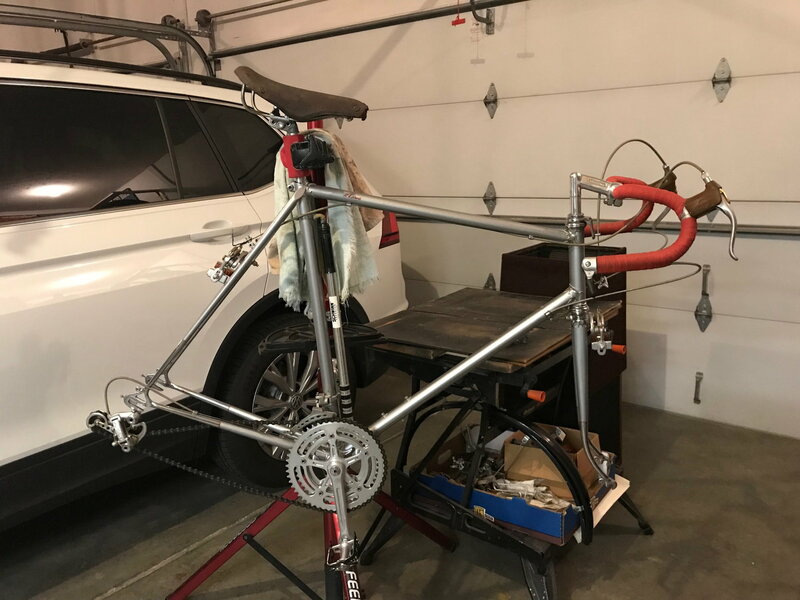 To me it seems that replacing the bottom bracket shell and repainting would be so expensive and difficult that it is unlikely. Any competent framebuilder can do it, Waterford is easily some of the best at it, piece of cake for them. Spendy, yes, difficult, no, especilly not for these guys in particular. 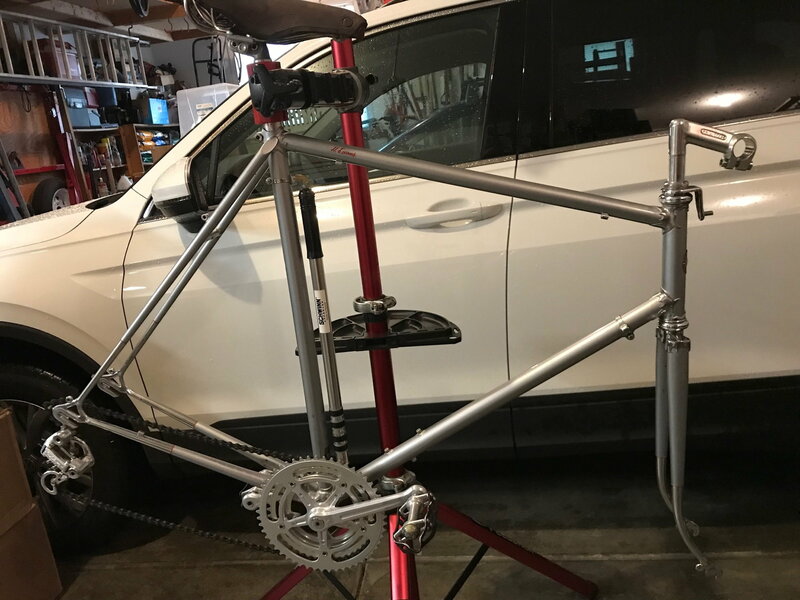 Paramount frames and Schwinn frames in general came with a lifetime warranty. Generally, the frame was replaced, but Paramounts could be repaired. A couple of other differences. One is a replacement, the other is a guess. Take a look at the picture below. 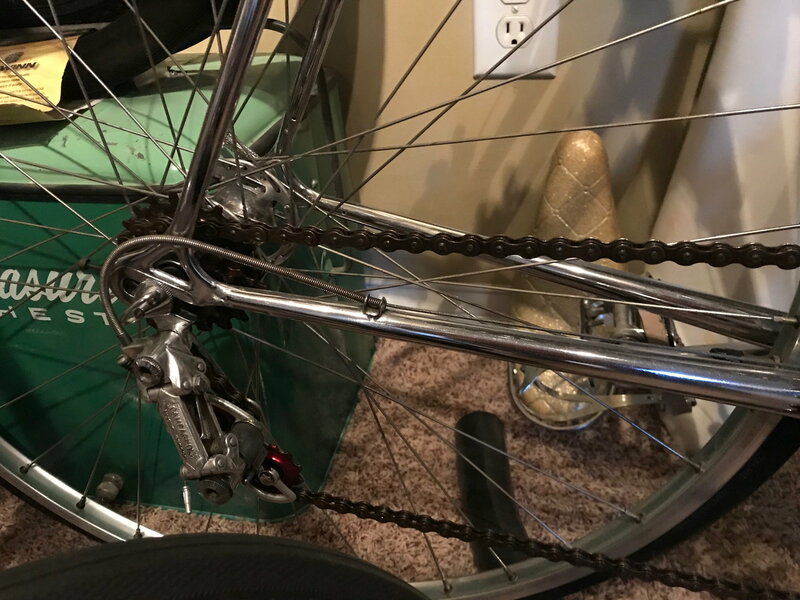 Notice the RD cable stop on the chain stay. Indy's P-15 definitely has a replacement. Also, and I'm guessing on this one, are the Campagnolo rear dropouts replaced and the longer version ones substituted? I'm not all that up on the subtle differences between P-13s and P-15s, so I could be wrong on this. Pictured are the two Chicago Paramounts I've had, both P-13s. The Coppertone one is a '66 and the Flamboyant Red one is a '71. Do mine look shorter? Or is this just an illusion I'm imagining? I'm also seeing bottle cage mounts on the downtube and the hourglass-style rack mounts on the seatstays that aren't on the other examples. Thanks Bob! Good eye you have! 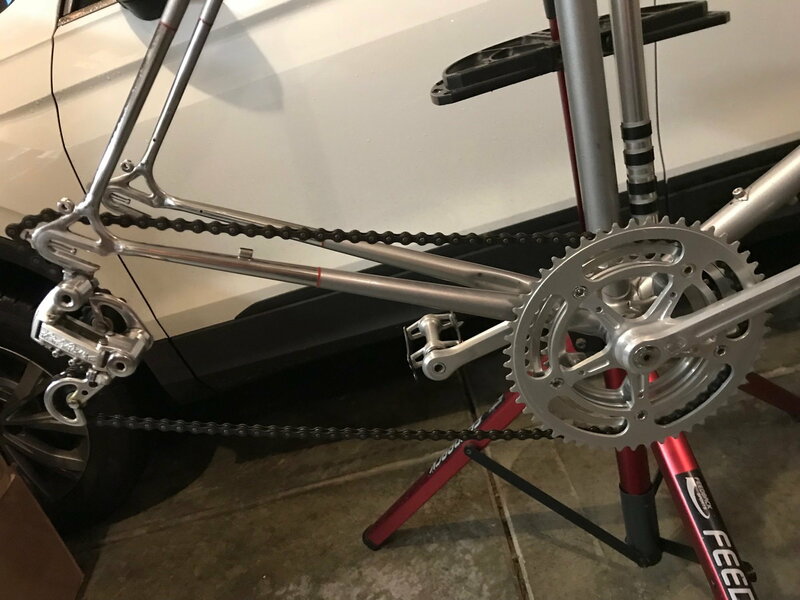 I measured the rear drop out, it's 2" and I compared it to my two Chrome Paramounts, they are also both 2", so it looks like an optical illusion. 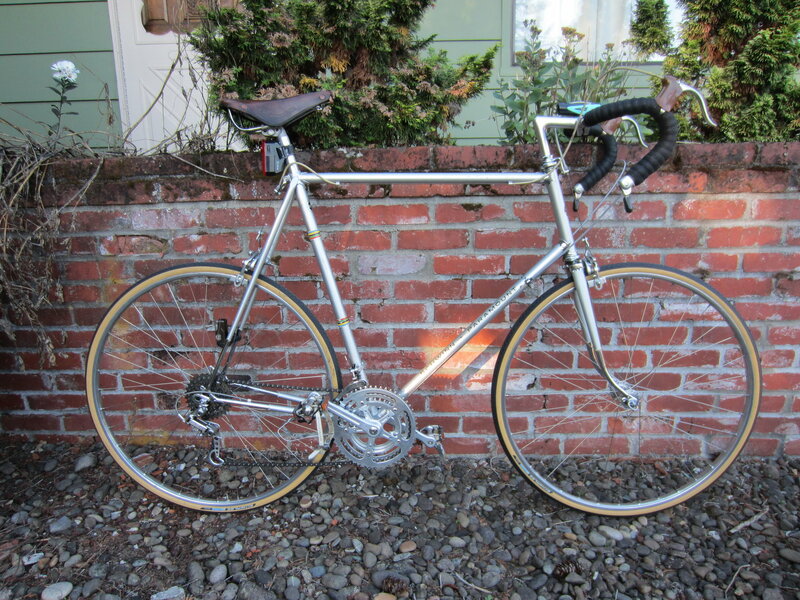 My chrome bikes are '70 & '74, both P-13s as I recall. I am attaching a couple of photos. 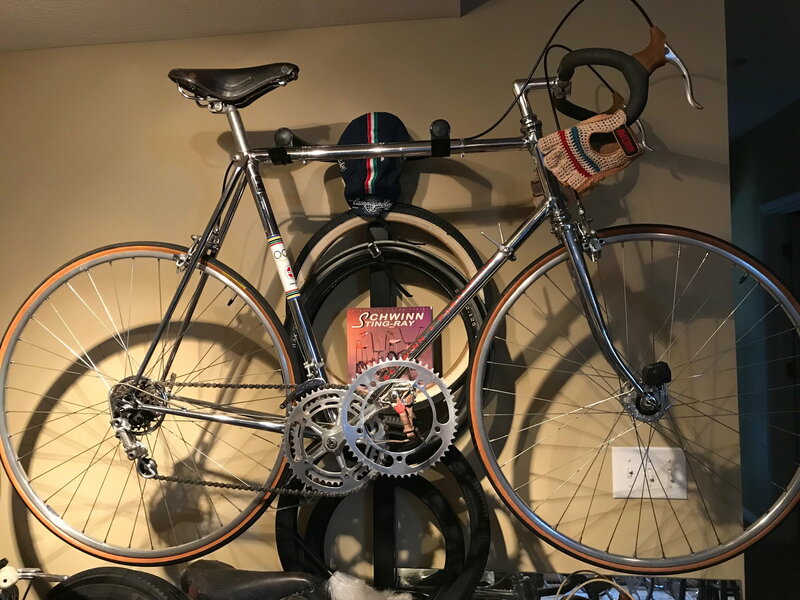 You'll see the '74 has the same rear derailleur cable stay as mine, solid, and the '70 has the style like yours that is open.